Wolfgang Amadeus Mozart , composer, violinist and piano virtuoso, was born on January 26,1756 in Salzburg, Austria and died on December 5, 1791 in Vienna, Austria. Mozart’s works are identified by Köchel numbers (pronounced “Kershel”), named for the Austrian musicologist Ludwig Kochel who, in 1862, published a numerical list of Mozart’s works in the order in which they had been written ‑ i.e., K. 1 was the first piece Mozart wrote and K. 626, the last. 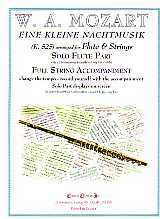 Eine Kleine Nachtmusik (K. 525) was written in Vienna in 1787 (completed August 10). Eine Kleine Nachtmusik is German for A Little Night Music, a name given the work by Mozart himself; it is also often referred to as Serenade in G, because it is grouped with his other String Serenades. Originally written for Strings (1st & 2nd Violin, Viola, Cello & Bass), it was made up of Five Movements; one of the movements (another Minuet) has since disappeared. In this arrangement, Flute replaces 1st Violin, with very few changes: 3 low Gs in the final 8 bars of the 4th movement were raised an octave and double stops (when the violin plays more than one string/note at a time) have been eliminated. In two sections in the 1st movement (measures 20-21 and 95-96) where the Solo part has 2 bars of repeated 16th notes, an Ossia (which means an alternate or other version) has been indicated using 8th notes. The sixteenth notes were the original notation, but the eighth notes are a more than acceptable alternate, which may be necessary, depending on how fast a tempo (speed) is played. An alternate version of the 2nd Movement has been included which omits the C Minor section (bars 57 to 68) and the turns. Turns (often called Grupettos) are played as five notes: start on the printed note, go to the note above, back to the printed note, to the note below, then back to the printed note - all in the key, unless an alteration is indicated (flat, sharp or natural) above and/or below the turn sign.